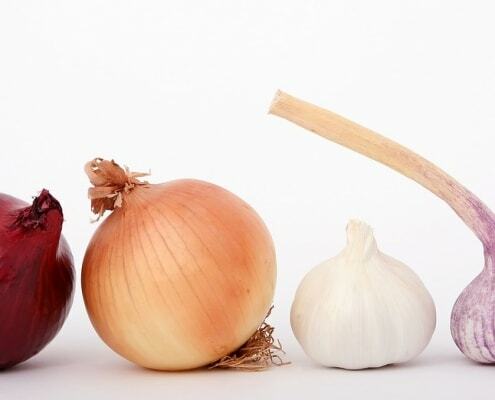 5 Veggies You Can Regrow From Kitchen Scraps. This was the first year EVER that the Todd and I had a sunny enough space for a garden. So Todd and Zoe happily planted little tomatoes and swiss chard, cucumbers and beets. And pumpkins! We just cut them today to decorate for Halloween! 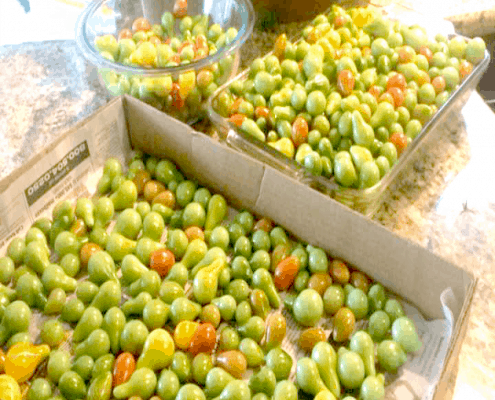 But sadly, we had our first hard freeze last night and we dragged in 42,007 little green tomatoes last night to ripen inside- we’ll have the easy DIY video for that tomorrow, in case you, too, were overly blessed with produce this fall. So now we have to move the whole fresh produce scenario inside. Which is where growing your own from kitchen scraps comes in. I am not kidding! Seriously, how handy is THAT? One of my ultra-disaster prep friends is crazed about this, but I like the concept for two reasons. 1-What a great money-saver to re-grow your own foods in a small garden space. Anyway, growing your own veggies is a good way to make sure you’re not feeding the offspring something packed with pesticides and such. And I love the idea that it’s one less thing that we’re dependent on finding at the store. Find complete directions linked with each category. Both re-grow nicely in a limited amount of soil. I strongly suggest buying organic- that reduces your chance of any diseases than can affect a potato crop. 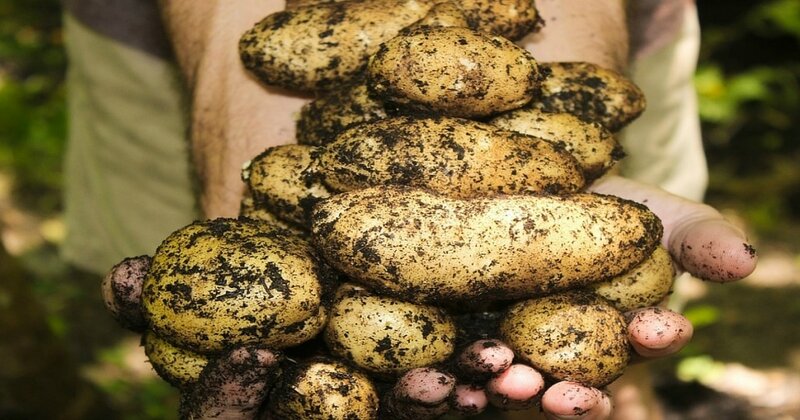 If you don’t already have some accidentally sprouted potatoes, (which is invariably how we start our plantings after finding the neglected potato basket) put two or three samples from your favorite varieties in a basket and place it in a cool, dark place. I store them in a cupboard underneath the sink, but if that’s too damp, try a dark corner of the basement. 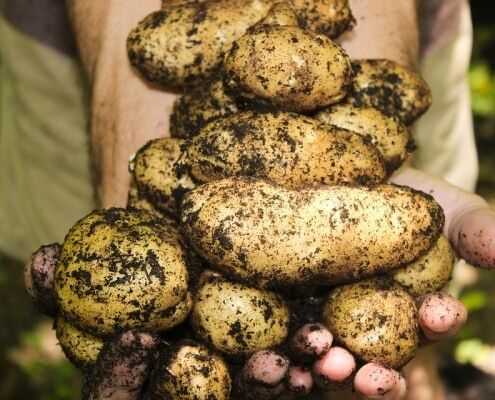 Check the potatoes after about two weeks, and pull them out to use once the sprouts begin to grow. Each “eye” or sprout can grow into its own plant, so cut the potatoes into chunks with one or two eyes in each. Set the chunks overnight on a layer of paper towels to allow the cut sides to dry a bit before planting. This eliminates the pieces from rotting after they’re planted. (Been there, done that.) You want a nice big container for these little fellas, and use potting soil instead of gardening soil. Keep the planter in full sunlight. Can all be re-grown in jars on the kitchen windowsill. It’s ridiculously simple: take the leftover base- the bulb or enough of the veggie’s base that contains the roots. Drop them in a glass with enough water to cover them, and move the plantings around so the roots are pointing down. Leave the jar in some decent sunlight, on your kitchen windowsill. Be sure to change the old water for fresh every couple of days so they don’t get… ugh… slimy. Within a week or so, you’ll see a nice little sprouting for fresh greens. All sprout beautifully from their original stems. Chop the veggie with a couple of inches left at the base. Place in a flat-bottomed dish with the base submerged about halfway. Warm water works best when you’re first getting these little fellas to sprout. The outside stalks will dry out, but you’re looking for those tender little yellow leaves in the center, which which grow nicely and turn green within a week or so. 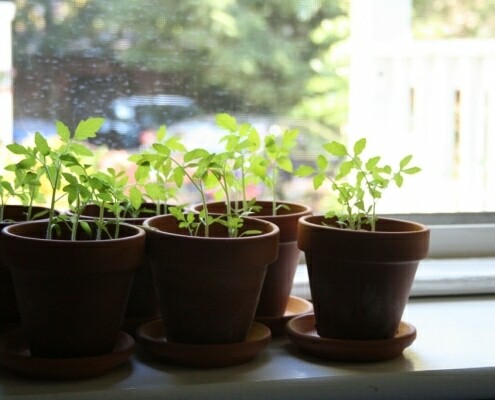 You can enjoy them right from the windowsill by slicing off what you want and keeping the original base, or you can plant the base in a pot with a mixture of dirt and potting soil- make sure the little sprouting leaves are above the surface- and it will grow as much as you like. 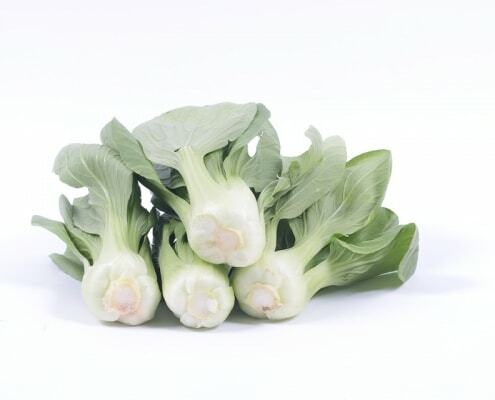 Don’t need light or much room, and they’re densely packed with nutrients. I have found that whatever type you want to grow does take a bit of a different approach, so I’m sending you Wikihow.com for precise instructions. 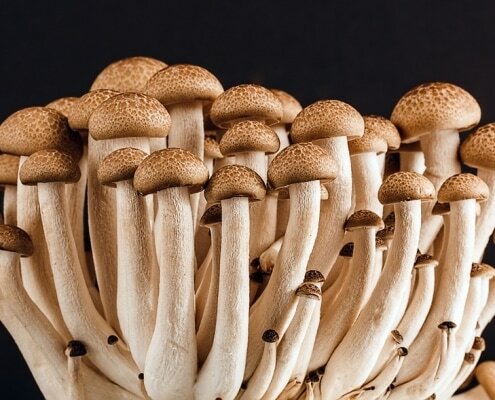 We grow the little white button mushrooms, but you can go quite exotic if you have the taste for them. Are surprisingly some of the easiest veggies to re-grow and have one of the shortest growing times. If you place a sprouted onion with the roots down in a glass of water, it will continue to grow on the top with new shoots. You can use the green, newly sprouted part for chopping up and using in recipes. 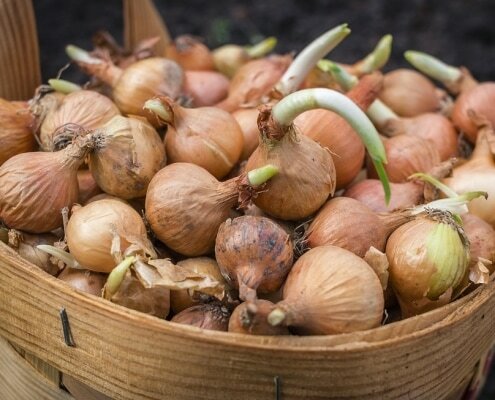 If you want the whole garlic bulb or whole onion, you can plant it, roots and all, in soil. I have a soft spot for Vidalia onions, and they’re delighted to grow with the least possible encouragement. I like my veggies low-maintenance, because my attention span is pitifully short. My 7 year old Zoe likes to plant an onion base in a pretty dish with water and some decorative rocks. It grows on her windowsill and we chop the new growth off at the base for dinner and the process begins again. I’m sure there’s some deeply philosophical life lesson I can teach her from this, but… she still thinks it’s a magic trick. But then, nature is kind of magical, isn’t it?